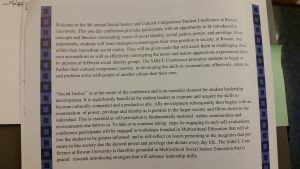 This weekend, I attended Rowan University’s 4th Annual Social Justice and Cultural Competence organized by their Office of Social Justice, Inclusion, and Conflict Resolution. 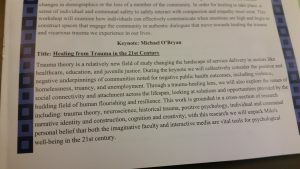 The conference theme was “Communicating Across Differences: Dialogues to Heal Our Communities.” Their keynote presentation resonated with me, so I decided that I would write about it in relation to our class. I was not able to get a hold of a transcript or video for the keynote presentation, so I attached three photos to this post to provide context. 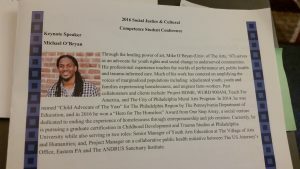 O’Bryan’s presentation relates to our discussion of inherited or generational trauma within groups of people. Throughout the presentation our discussions during the first unit “Historical Antecedents” were in the back of mind, especially in relation to how African American populations feel the effects of slavery and medical disparities presently. His presentation also made me rethink how to engage with social justice to be more compassionate and inclusive. This is something that came up during the conference introduction, my workshop, and the keynote presentation. What baggage do we carry in calling people out on problematic practices? How do we engage with inequitable structures without reproducing a another inequitable structure? Content warning for articles: There is derogatory language used against transgender/gender-nonconforming individuals and folks with mental disabilities. There are also descriptions of medical violence. 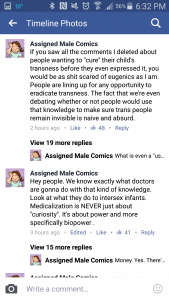 “A New Departure from Eugenics” discusses how most countries once required sterilization as a requirement for transgender folks that wanted to transition or receive medical care. Although the United States wrote the sterilization requirement out, France and several parts of Europe still have sterilization requirements for transgender individuals. The article argues that this is a form of present-day eugenics that is not discussed often enough. 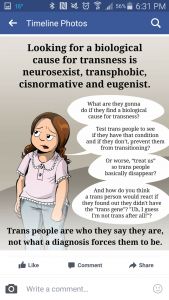 The author also states that eugenics is often thought of only in terms of race and psychological ability, even though transgender individuals have historically been victims of eugenics. “Eugenics and the practice of transgendering children” questions whether hormone therapies are “the answer” for transgender children. The author argues that eugenics is returning to Australia through medical processes transgender children often experience at the consent of their parents. 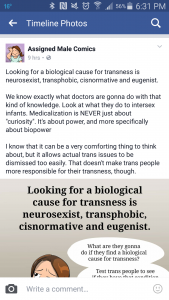 Although the author has an interesting point in questioning transition and biological/cultural alignment as a point of reference for transness, I question why they do not mention the violent “gender-reassignment” surgeries performed on children with “ambiguous genitalia” at birth. 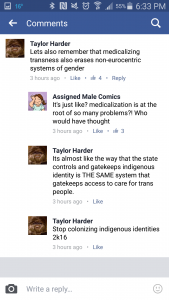 I am also wary of the author treating transness as a problem without a solution. There were several points that I thought were inconsistent in the articles I read. Both articles relate in their binaristic view of gender, or in thinking that individuals are either man or woman. They also both assume that physical transition and gender dysphoria are inherent parts of transness. 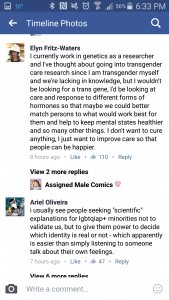 It would have been interesting to see both bloggers complicate their arguments by including nonbinary individuals and a greater range of (non)transition, in addition to considering experiences outside the “stuck in the wrong body” narrative. However, these articles do align well with several of our questions around consent within living laboratories. One of the reasons I wrote about both articles is that each presents a genocide against transgender people but in very different ways. “A New Departure . . .” deals with transgender adults within the legal-medical system with the lens of human right, while “Eugenics and the practice of transgendering children” talks about transgender children within a more fluid moral-political-medical (?) system. I found the latter much harder to pin down and process. How is genocide defined today along gender lines? Is it based on the limits of personal bodily autonomy? If so, can children make that choice? How does age change consent in medical processes? Do the terms “genocide” and “gendercide” resonate differently for you? When should we use each term?